Allen Hastings (general contractor) set up their fenced work area Monday morning. Electrical and water isolations to the old washroom were done. (The water isolation also isolates the water supply to the south side of the east wall.) 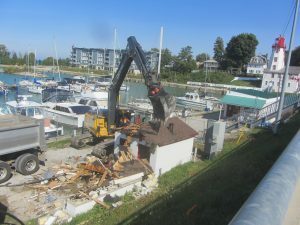 Ackert Excavation was on site by mid morning, and the old washrooms were demolished and completely removed by mid afternoon. Further work determined that the hydro pole by the stairs would be too close to the excavation for safety. This was identified to the engineers (B. M. Ross) for disposition. 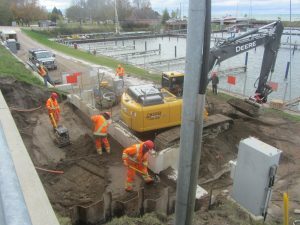 With the sewage pumping station taken out of service for the day, work continued with rerouting the power cables for the pumping station out of the location for the new washrooms. 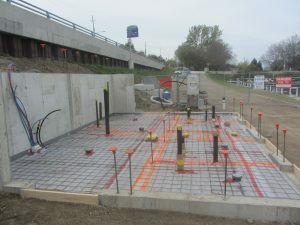 This work was completed by mid afternoon and the pumping station was placed back in service. 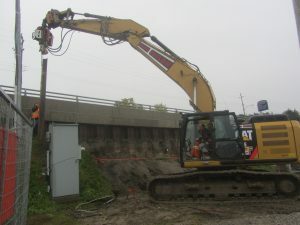 B. M. Ross is preparing drawings to shore the hydro pole so that excavation work can continue. When this is completed and accepted, work will continue. 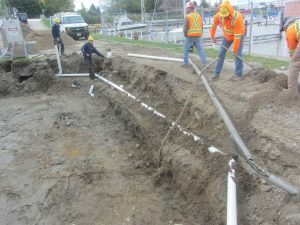 Shoring of the hydro pole will be done on Tuesday, Oct 2, with excavation for the new foundations to follow. 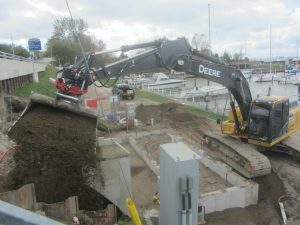 Please keep the driveway clear on Tuesday as heavy equipment will be required to drive the steel piling for the shoring. McLean Taylor Construction was on site today and drove in steel piles to shore up the hydro pole by the stairs. 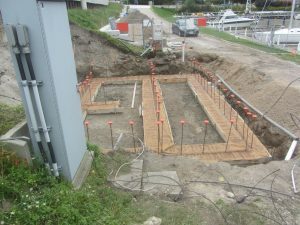 Tomorrow, excavation for the foundation of the new washroom will resume. Excavation continued today but a few problems were encountered. 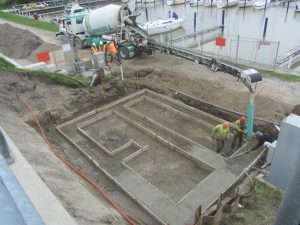 The first was discovery of a number of large concrete blocks in the excavation area with tie rods connecting them to the concrete cap which is above the original wood pilings. This formed the original wall of the marina. It was determined that these were now non functional as the sheet steel that now forms the wall of the marina was installed in the mid 1960’s. 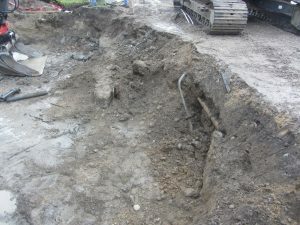 The concrete and the tie rods were removed and excavation then continued. 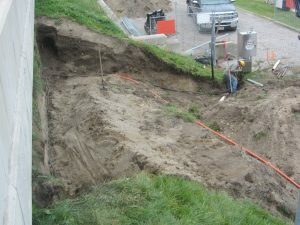 The next setback was discovery of the sewage line for the boat pump out was inside the excavation area, and it was made of transite. (asbestos-cement). It was determined that it would have to be removed and the new line relocated. 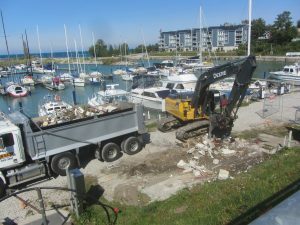 The sewage pumping station was isolated and the old transite sewage pipe was removed and properly disposed of. 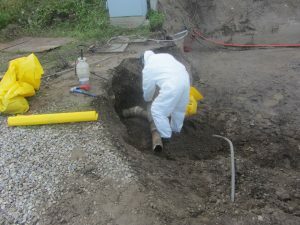 A new sewage pipe was installed and connected, and the sewage pumping station was placed back in service. The excavation was completed, and the footings will be poured tomorrow. Footings were poured this afternoon. The plan for the next week, according to the Allen Hastings site supervisor, is to install rebar and forms for the foundation walls on Tuesday (and possibly Wednesday morning) pour the foundation walls on Wednesday, remove the forms late Thursday, and backfill on Friday (since we are backfilling both sides of the walls) to be ready for lift out on Saturday. Please note, masts can be moved through the fenced area when workers are not present, but there is to be no vehicle traffic in the area. A lot of work has happened in the last few days. 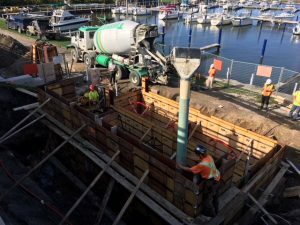 On Tuesday, the forms for the foundation walls were erected, on Wednesday the foundation walls were poured, and today the forms were removed, and waterproofing applied where required. On Friday, backfilling will be done prior to lift out on Saturday. 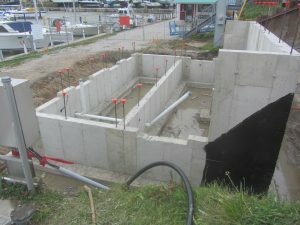 Backfilling on Friday was sufficient so that there was no problem with crane access for lift out on Saturday. 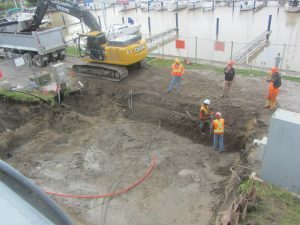 Backfilling will continue today, and probably part of Tuesday, with the plumbers scheduled to start the floor plumbing installation on Wednesday. Backfilling was completed today. The decision was made to not place topsoil on the slope behind the washroom until next spring, at which time the slope will be finished and seeded. Troy’s Plumbing and Heating began the layout and installation of the in floor plumbing. All the in floor plumbing has now been installed, levelled, checked and rechecked. The metal mesh has been installed and we are now waiting for the concrete floor to be poured. 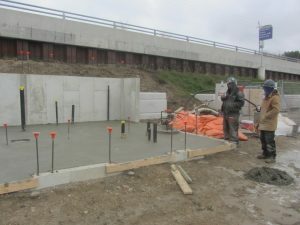 The pouring of the concrete floor is expected Monday or Tuesday next week. 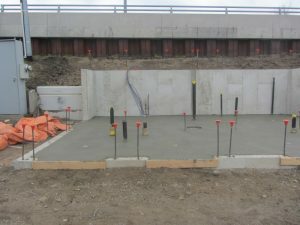 It’s been quite a while, but the washroom floor was poured today. Weather and personnel added to the delay, but the floor is poured, and has been covered with insulated tarps for curing in this this weather. 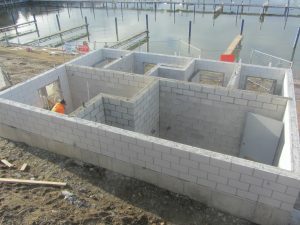 At least three days will be required for curing, so block work will probably not start until next week. After a long wait, due to the poor weather we have been having, masonry work is now underway with the erection of a protective ‘tent’ around the building site. This should be complete by the end of the day today, with actual block work to start on Wednesday. 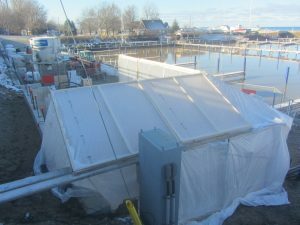 This enclosure will be heated, and work will continue through the next weeks. Construction of the perimeter walls was completed today. Work throughout this week will be construction of interior block walls and plumbing installation. 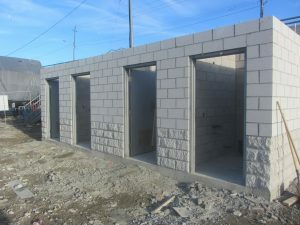 The block walls for the new washrooms were completed today. 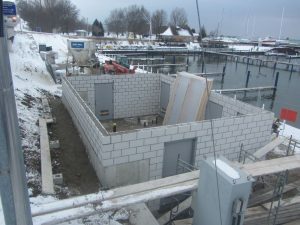 Framing for the upper walls and roof will start tomorrow. 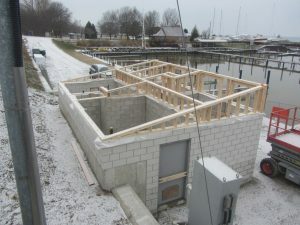 As seen below, framing is underway and the structure is beginning to take shape. Construction is now shutting down for the holiday season, and work will resume in January. The washrooms will be available for use prior to early lift in! A lot was accomplished this week even with losing one day due to snow squalls and high winds. 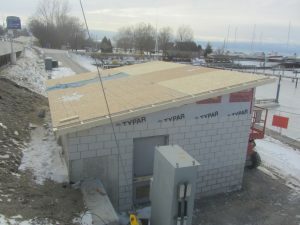 The roof is on, front windows installed, and framing of outside is complete. 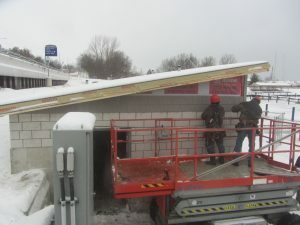 Current plans are to have the washrooms complete by the end of February. 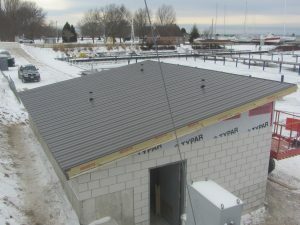 The metal has now been installed, and work is progressing on the siding which will be installed between the roof and the block walls. The electrical has been roughed in and the first electrical inspection is scheduled for later today. 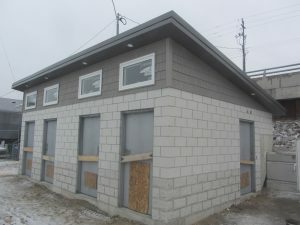 The outside work on the new washroom has been completed, with the exception of the door painting, installation of door hardware, and pouring the concrete sidewalk around three sides of the building. Some of this work will need to wait for better (warmer) weather. Inside, the rooms have the tongue and groove ceilings and upper walls installed, and are now waiting for the concrete block inside walls to be painted. All the plumbing and electrical has been roughed in, and further installation also depends on the painting. 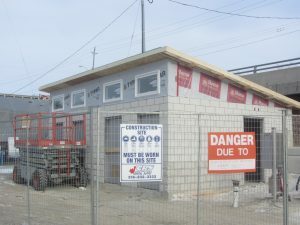 The new washrooms will definitely be ready prior to the 2019 season. Work has now started again on the washrooms. Four of the doors were replaced with ones with the correct configuration, and electric heaters were installed in each of the rooms in preparation for painting to start tomorrow.